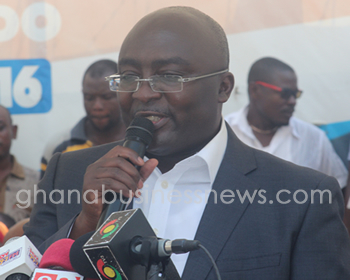 Vice President Dr Mahamudu Bawumia has said government would borrow responsibly to execute government projects to ensure fiscal discipline and debt sustainability so as to restore the confidence of investors in the national economy. To this end, he said government would amend the Public Financial Management Act to limit the fiscal deficit to range between three and five per cent of the country’s Gross Domestic Product (GDP) starting from 2018. “We are going to reduce the debt to GDP ratio over time. It doesn’t mean that we’re not going to borrow money but borrow responsibly and not recklessly,” he emphasised. Vice President Bawumia said this at the closing ceremony of the Second Edition of the National Policy Summit, in Accra, on the theme: “The Industrial Transformation of Ghana”. The two-day event, which featured the Ministry of Trade and Industry, afforded the opportunity to the various stakeholders, especially the business community, to make inputs into government policies for sustained economic growth. Vice President Bawumia gave the assurance that government would remove all bottlenecks for doing business and expand opportunities for the private sector entities to create jobs. He said although government could achieve more success, it would require the cooperation of the business community and all other players in the economy to achieve the industrial transformation agenda. On paperless port, Vice President Bawumia said government would from September 1, 2017 roll out approved recommendations to change the face of port operations to meet international standards in order to enhance the nation’s trade competitiveness. He said government would require the cooperation of industry players to implement three key measures at the port including; mandatory joint inspections at the port, paperless processing of all relevant port documents and abolishing all internal Customs barriers on the country’s highways. “We will not tolerate the inexplicable charges, delays, lack of transparency and overall complicity in the operations at the port. “We’re moving from a system of applying sub-standards and unnecessary complex procedures at the port to a system which meet international standards and is in conformity with trade facilitation agreements,” he noted. The Vice President noted that these measures and other economic reforms that would be rolled-out by the end of the year such as the digital addressing system, the national identification system and interoperability of the payment system for financial inclusion would put the nation on the path of prosperity and economic growth. For his part, Mr Alan Kwadwo Kyerematen, the Minister of Trade and Industry, said although government had ambitious programme for industrial transformation and economic growth, it would required four key principles to accomplish it. He noted that there could be no action without ambition and that the kinds of challenges that the government sought to address in this country required ambitious programme. “There is no evidence anywhere in the world of any country that has achieved superlative growth that has not been ambitious and in terms of implementation I believe Ghanaians have the capacity to achieve them,” he noted.